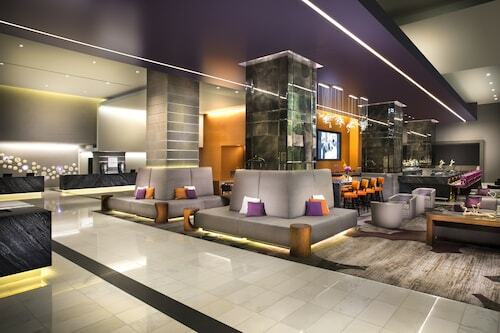 Expedia can help you save heaps with Hollywood travel packages. With all that extra cash in the bank, you might even like to book a few extra nights. Would you like to save up to 40,450 YEN*? Book a package deal on Expedia now! Itinerary need filling up? Hollywood vacation all organized but don't know what to do when you reach there? Let us make it easy for you. A mountain of effort goes into creating movies. Paramount Studios gives cinema addicts the opportunity to observe how it all comes together. There's an excellent range of things to do in this destination. You don't have to be a grave hunter or a tombstone tourist to appreciate a stroll around Hollywood Forever Cemetery. Why not see if you can join a tour and learn some of the history behind this fascinating open-air museum? Still got time to spare? The intimacy and artistry of live theater is difficult to deny. Get tickets for a production at Pantages Theatre and feel the magic for yourself! Life is either a daring adventure or nothing at all, so why not embark on some new and thrilling experiences? 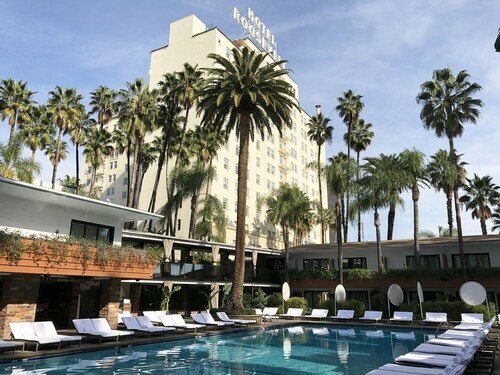 For a comprehensive list of activities, head to our Hollywood things to do page. Sometimes, searching for a great place to stay can be tough. Fortunately, that isn't the case in Hollywood. Here, you'll be able to choose from as many as 34 options. Expedia's the place to go for the greatest cheap vacations and luxury getaways. On the lookout for a comfortable place to stay with an inexpensive price tag? 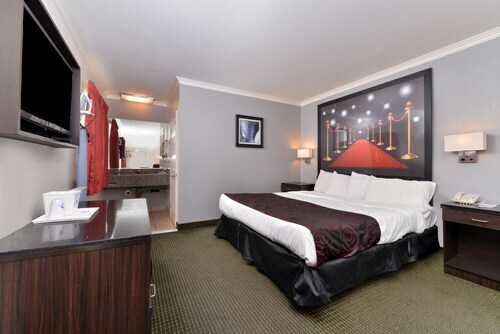 Have a look at the Hollywood City Inn (1615 N. Western Ave) or the Hollywood Palms Inn and Suites (6055 W Sunset Blvd). Both have good reviews, and they don't cost an arm and a leg! If caviar and Champagne are more to your tastes, pack your designer luggage and indulge yourself at The Redbury @ Hollywood and Vine (1717 Vine St) or the W Hollywood (6250 Hollywood Blvd). Need to work out how to commute from Los Angeles International Airport (LAX) to Hollywood? After you have picked up your bags, you'll be about 11 miles (18 km) to the southwest of the neighborhood. Attracting Hollywood's stars since it opened in 1927, The Hollywood Roosevelt offers a prime location along the Hollywood Walk of Fame, across from Grauman's Chinese Theatre and the Hollywood & Highland center. 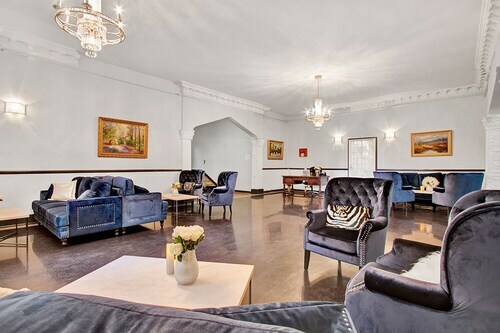 Located in Hollywood, Los Angeles, this two-story motel is 600 meters from Barnsdall Art Park and less than 2 miles from the Walk of Fame and Wax Museum. Universal Studios is 4.8 miles away. Located in Hollywood, this aparthotel is within a 10-minute walk of Hollywood Walk of Fame, Dolby Theater, and TCL Chinese Theatre. Pantages Theatre and Hollywood Wax Museum are also within 15 minutes. Hollywood - Highland Station is 8 minutes by foot and Hollywood - Vine Station is 12 minutes. On Hollywood's famous Sunset Boulevard, this hotel is 0.3 mile from Grauman's Chinese Theatre and 0.5 mile from the Hollywood Walk of Fame. Universal Studios is 3 miles away. 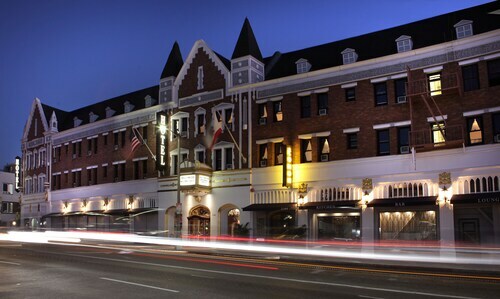 Located in Hollywood, this historic hotel is within a 10-minute walk of Melrose Avenue and Paramount Studios. Hollywood Palladium and Wiltern Theatre are also within 2 mi (3 km). Hollywood - Western Station is 29 minutes by foot. 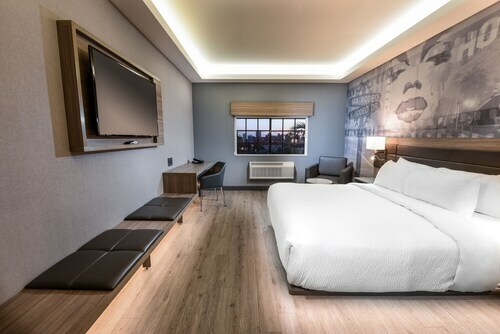 Located in Hollywood, this hotel is within a 10-minute walk of Hollywood Walk of Fame, Pantages Theatre, and Hollywood Palladium. Dolby Theater and TCL Chinese Theatre are also within 15 minutes. Hollywood - Vine Station is 8 minutes by foot and Hollywood - Highland Station is 13 minutes. 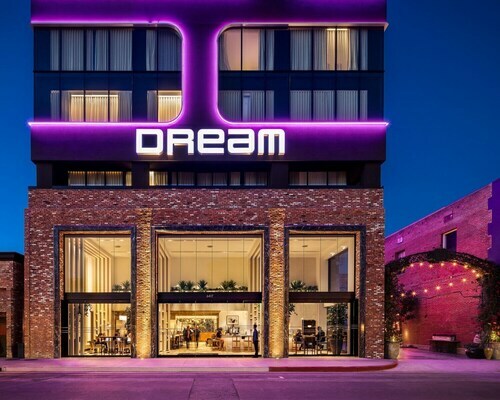 Located in Wilshire, this hotel is within 3 mi (5 km) of Melrose Avenue, Walt Disney Concert Hall, and Los Angeles Convention Center. Paramount Studios and Wiltern Theatre are also within 3 mi (5 km). Vermont - Beverly Station is only a 2-minute walk and Vermont - Santa Monica Station is 18 minutes. TYO-All Airports - Los Angeles Intl.